There are several updates on the coast to coast, Aidan's Mini Bike Ride, Guinness World record attempt. First of all, we decided ( Tim Ford and myself) that since we were doing it unassisted and don't have room on our mini bikes to carry hardly anything, including clothes, we would just do it with the clothes we are wearing. We came up with the idea to wear Blues Brother suits the entire way. It just made more and more sense. They were on a mission from God and so are we. They were doing it for a children's charity and so were we. They hate Illinois Nazi's and so do we. We are also trying to promote awareness and education about ALD and what better way to get people's attention along the way. Just look how much attention they drew when they showed up at the state house to pay the back taxes. So for 21 days, Tim and I will be Blues Brothers across America. Have the four fried chickens and a coke ready for when we come through your town- I'll just take dry toast. Next is the route. We'll be taking the southern route across America leaving from Daytona and riding across the panhandle of Florida and the gulf coast to Louisiana before heading slightly north to Dallas. Dallas is 1200 miles and we hope to be able to be there in a week but that will be some really long days ahead. There are a few Motor Maids in Louisiana that are going to host a fundraiser around Thursday the 23rd and if time allows, we will also try and visit the state house in Baton Rouge to carry some legislation about mandatory newborn testing. We will then go to Rick Fairless' Strokers in Dallas, Texas where Sunday March 26th, we will have another fundraiser. We are going to travel back down south to Austin and carry legislation to the Texas State House before heading west. I'm going to leave the rest of the route open due to time and logistics of more fundraisers along the way. In the planning stages are more fundraisers. Possibly doing some in Daytona before we leave, more out west and even a major rock band trying to spearhead a fundraiser. Also in the developing stages are some of the merchandise from this ride. We are working on tee shirts, patches and stickers of the logo above. They will all be available on the Aidan Jack Seeger Foundation website (www.aidanhasaposse.org/). More info will be coming soon so stay tuned and don't be surprised if The Penguin shows up. A big shout out to Biltwell Inc., Rick Fairless' Stokers Dallas and Buddy Johnson who has already gone above and beyond to help get this ball rolling!!!!! 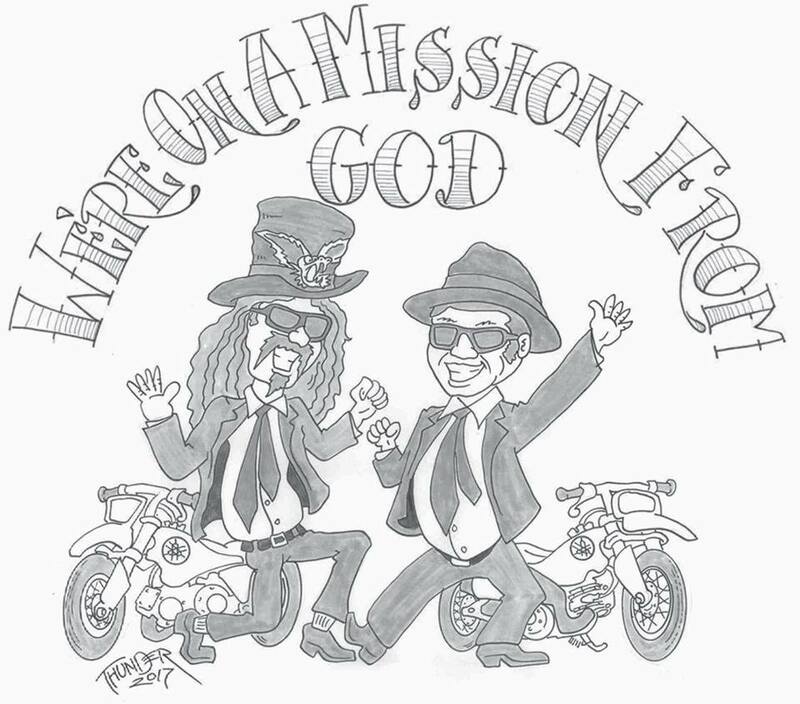 Special thanks to Don "Thunder" Baggett who did the awesome illustration of us and our mini bikes.